Have you ever been such a big fan of a company that you ended up working with them? That’s exactly what happened to Sally Beare who runs the Tunbridge Wells area of Riverford Home Delivery. 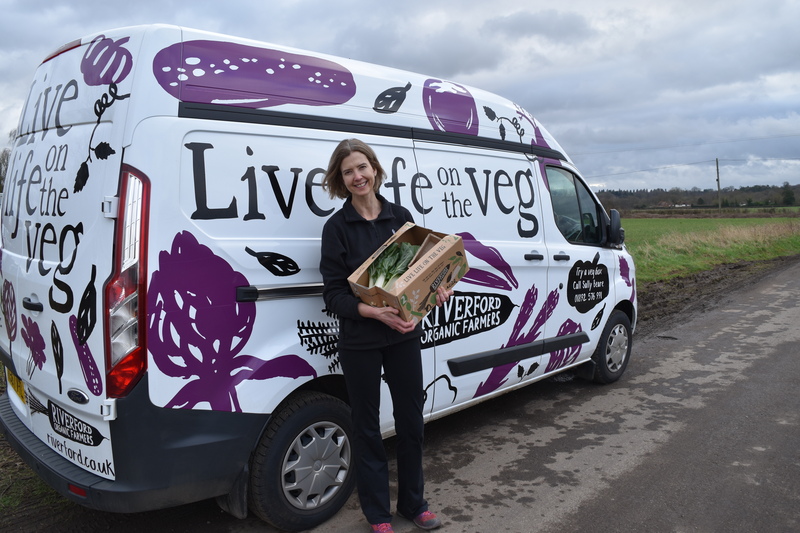 Sally had been a customer of Riverford’s for a number of years and when she decided the time was right to return to work after having her 3 children, this opportunity happened to land at her feet. It was not just the produce that made Sally a customer in the first place, she is totally behind the ethics of Riverford who grow much of the produce themselves on their organic farms in the UK (and now in France to extend seasonal supply). What they don’t grow themselves, they source from partner farms – always 100% organic – with whom they build fair, long-lasting relationships. Riverford started 30 years ago when founder, Guy Watson, started delivering organic vegetables in his wheelbarrow to 30 local friends in Devon. They now deliver boxes to up to 50,000 customers each week. 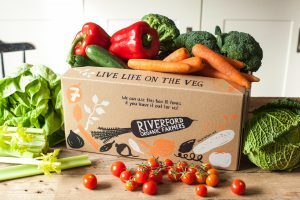 It’s not just fruit and vegetables that Riverford are able to deliver but their range also includes organic meat and dairy products, drinks (including wine) and there is an online Farm Shop selling many other organic delights. There is no contract so you can either order on a regular basis or just for special occasions. You can choose from set fruit and veg boxes or create your own bespoke orders (minimum order £15.00). 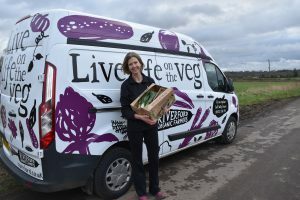 For some of us, cooking does not come naturally (that’s me), and the idea of receiving a box full of veg that you might not necessarily have had before can be a little daunting. How should the items be stored? What is that leafy purple thing? How should these be cooked? Fear not, Riverford have thought of all this and have produced an A-Z guide of the veg they sell and next to each item is a ‘Store & prep’, ‘Cook’ and ‘Friends with’ section as well as information on when certain foods are in season. You’ll become a veg pro in no time with the easy to follow information. You can also find recipes on the website or, with your third order, you’ll receive your very own recipe book. Sally is also more than happy to share recipes with you. Excess packaging has been an issue for a long time and Riverford like to be as eco-friendly as possible and will re-use your empty boxes and re-use or recycle any other packaging you might have received with your order. They use much less packaging in the first place compared to supermarket organic produce. Delivery is free and Edenbridge customers receive their orders on a Friday. Don’t worry if you’re not in to receive your delivery – just tell Riverford where to leave it. If you’d like to find out more about Riverford Organic Farmers and the products available, visit their website at www.riverford.co.uk or call the farm on 01803 227 227 or speak to Sally direct on 01892 576 991.